The view from the air was pretty unequivocal: billows of clouds borne on northerly winds, cascading down snow-covered mountains towards the ocean. Offshore, ships battled against the icy gale, burying their bows in huge seas and raising sheets of spray. To me, it really didn’t look like boating weather. As our British Airways jet wheeled around on its final approach though, I could see that conditions inshore looked more civilized. It was an offshore wind, after all; the water close to the shoreline was patterned with lively cat’s-paws but still seemed pretty flat—it might be okay. Meanwhile, our game little Airbus was being not so much buffeted by the wind as swatted. It took the flight crew two attempts to get it on the ground. After that, amidst freezing blasts of wind whipping across a deserted marina the next day, the ice-slick deck of the MCY 65 seemed like a comfortable place to be. 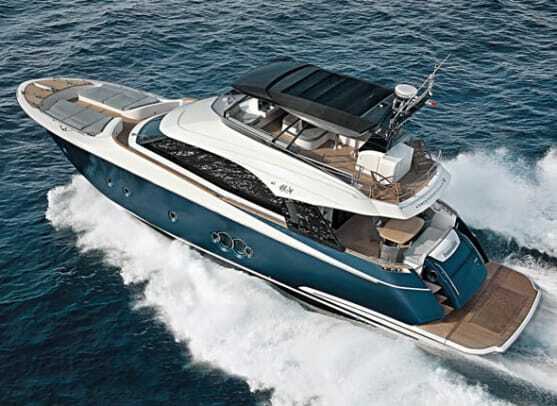 Monte Carlo Yachts’ new baby was introduced last fall at Cannes, and this first example, with its custom blue paint job, had cruised right around Italy from the Monfalcone shipyard in the middle of winter to catch a ship to China. 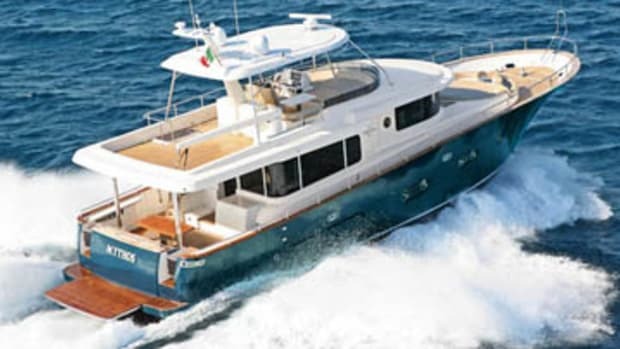 Sharing a distinctive profile with her bigger sister (see “Avant Garde,” January 2011), the 65’s Portuguese bridge is probably unique among nontrawler yachts in this size range, and with deep bulwarks it has unusually secure decks. Daring to be different is a feature of this yard. 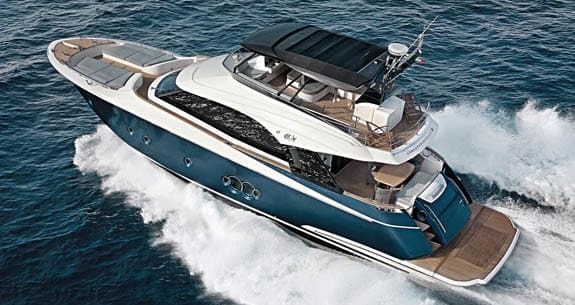 Part of the giant Beneteau boatbuilding combine, MCY is run as an autonomous operation in Italy and takes great pride in its technology. Resin infusion is not such a rarity as it once was, and it is probably no surprise that the optional hardtop is made of carbon. But the modular assembly methods employed at Monte Carlo Yachts—where interiors are built in their own tray moldings before being lowered into the hull and bonded in place with tolerances as low as five millimeters—represent the kind of manufacturing precision not often seen in production boatbuilding. The resultant monocoque stiffening of the structure takes up a lot less space than conventional frames and stringers and adds useful, usable volume to the hull. 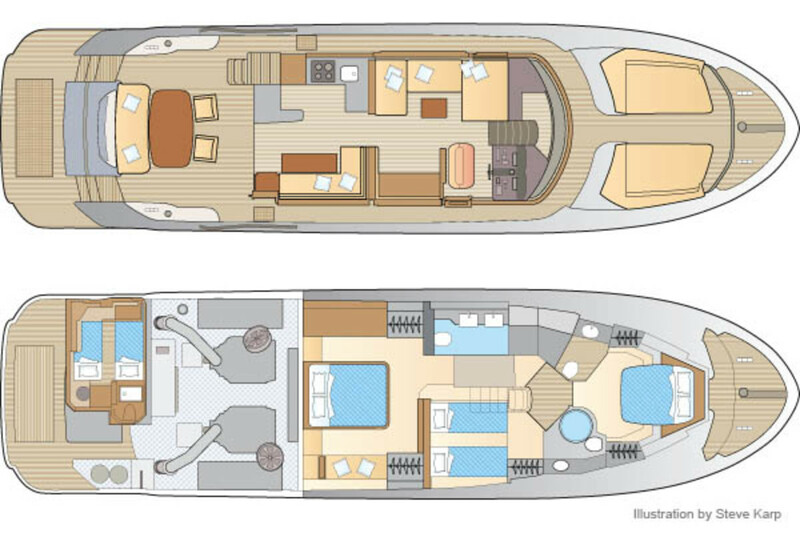 So the 65 is noteworthy for its generous headroom below decks and for the amount of stowage space built in, taking advantage of the available width and depth. 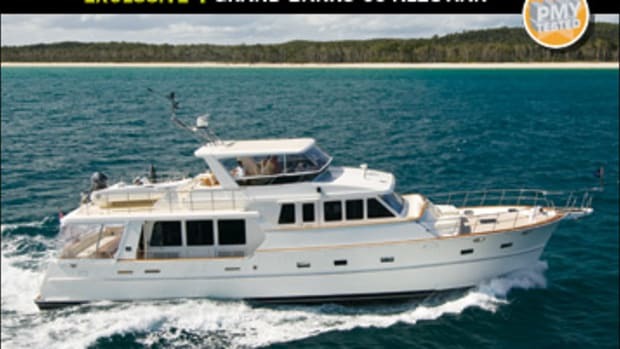 You can see this in all the cabins but particularly in the unusually spacious guest twin, as well as in the 65’s businesslike engine room, which feels much more roomy than any 65-footer’s has a right to be. Modular construction is also quicker and cheaper than traditional boatbuilding methods. This has allowed the shipyard to look hard at the standard specifications. 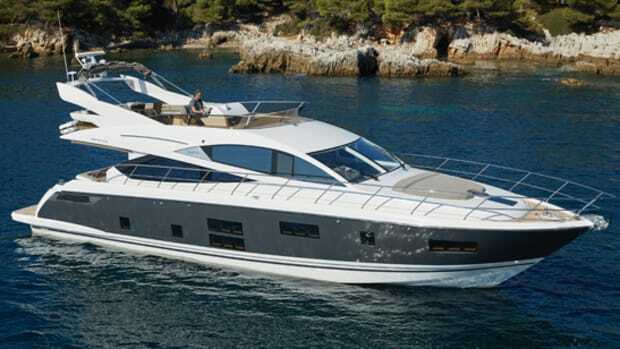 True, this list lacks any serious entertainment equipment but, remarkably, it does include a fully fitted and very comfortable-looking twin-berth crew en suite. 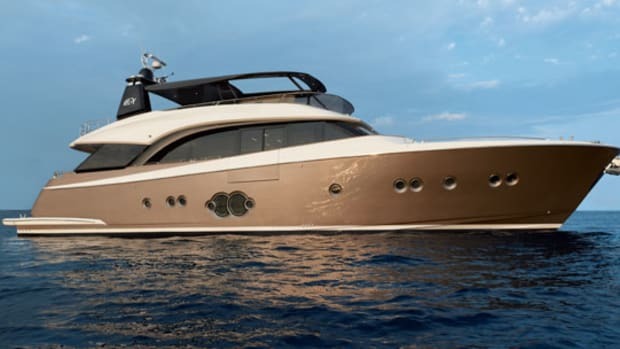 Nuvolari-Lenard takes care of styling and interior layouts for Monte Carlo Yachts, and it too is quite happy to do things a little differently. The galley-aft layout of the 65 works especially well. With the aft doors hinged open and no step separating the interior and exterior spaces, the dining area and cockpit seating form the base of a sociable triangle with the galley at its apex. The raised seating area amidships, meanwhile, serves as a separate, secluded saloon that can offer a touch of welcome privacy when moored stern to the quay. 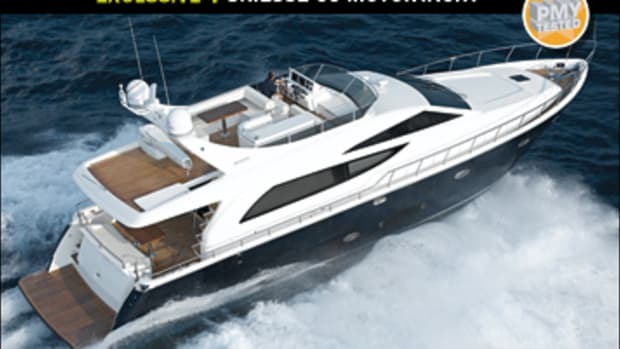 The 65’s flying bridge extends across virtually the full beam and provides a wide expanse of relaxation space that can be sheltered by the optional T-top, with its sliding fabric sunroof. The barbecue area has been placed right aft, which is a sensible use of space. However, if I were the chef I would definitely want higher guardrails here, especially when using a glass of wine as a cooking aid. 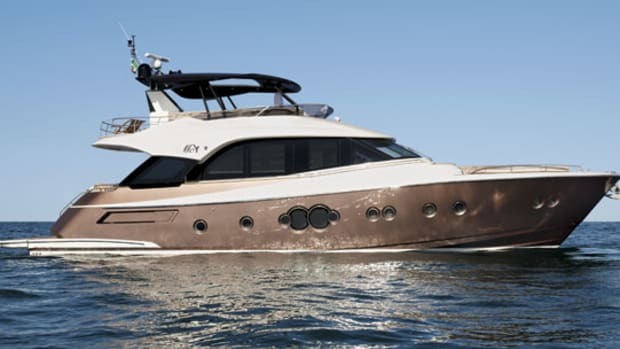 The forward sunbathing area is easy and safe to access thanks to that Portuguese bridge, and as on the MCY 76 the foredeck working area is recessed into the deck, to improve security during mooring and anchoring operations. Stowage has not been forgotten out here either—there are big, useful lockers both forward and on the flying bridge. 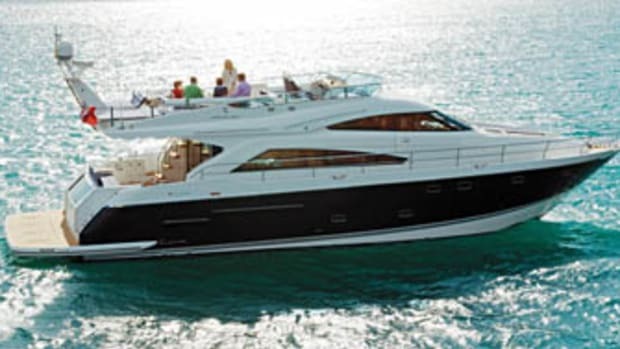 Monte Carlo Yachts offers three levels of interior décor, ranging from “standard”—which looks pretty nice—to the “extra luxe” finish on this boat, which calls in expensive designer fabrics, excellent, tactile detailing, and acres and acres of elegant leather. 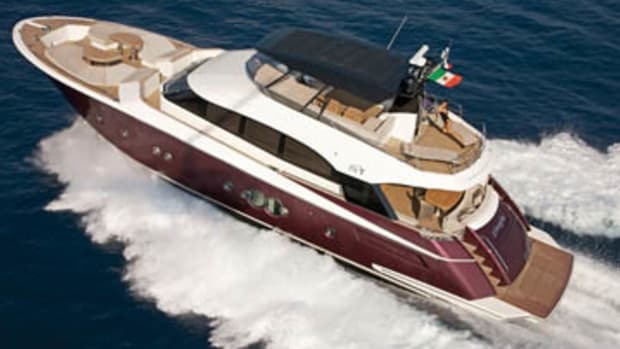 It’s all beautifully executed and extremely plush, but if you have your own ideas for the interior, the shipyard will be happy to introduce you to the designers at Nuvolari-Lenard and produce a custom scheme just for you. Our 65 was fitted with the standard twin 1,000-hp MAN diesels—there are another 400 horses available if you wish—and as we wrapped up in gloves, hats, and scarves and headed out of the marina, the two big V8s were barely audible. My aerial impressions of the previous day proved correct: inshore, although it was blowing hard and bloody freezing, the water was flat enough to get our performance trials in. At this point the crew confided that the boat was stopping off at the Hainan (China) Rendezvous before being delivered to her owner in April and was therefore carrying some brochures—about a ton of them. So although the fuel and water tanks were relatively light, at full cruising displacement we nevertheless managed a two-way top speed of just under 29 knots—slightly shy of the shipyard figure. Acceleration was also a bit on the slow side by current standards, at around 24 seconds to 20 knots, but that is hardly an issue on a cruising boat. She climbed happily onto the plane with no fuss once the secondary turbos kicked in and handled with verve and precision, barring the odd bit of spray which came aboard—to no one’s surprise in these conditions. 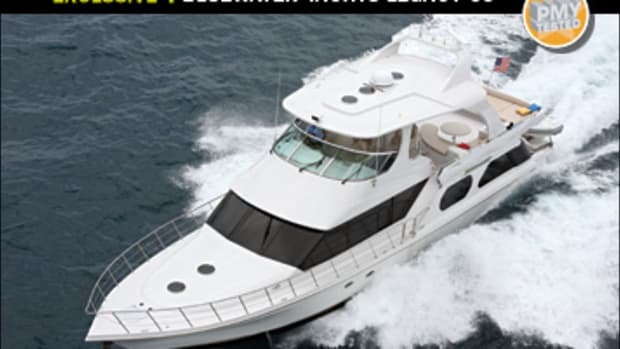 As we headed farther offshore to find some lumpier water, the 65 showed herself to be comfortably poised and capable of relaxed and remarkably quiet cruising throughout a good range of planing speeds. Overhead, a 737 coming in low on its final approach was being buffeted by icy blasts eddying off the mountains. My stomach gave an involuntary lurch. My flight back was in a couple of hours—but to me, it really didn’t look like flying weather. 296 gal. fuel, 61 gal. water, 9 persons, 2,400 lbs. gear.